It’s one of the biggest announcements you’ll ever make in your life, so why not make it one of the most memorable days of your life until your wedding? An engagement party is centered around a dramatic declaration, and it deserves an equally dramatic backdrop. There’s no better venue for a NYC engagement party than on board our 3-deck luxury yacht, the Skyline Princess. A Skyline Cruise is perfect for any occasion and that’s because we have experience for hosting all types of events and celebrations since we’ve been in business starting in 1993. We do engagement parties and so much more. Skyline hosts corporate events like private yacht charters, business meetings, holiday parties and fundraisers. We host Sweet 16 birthday parties, Quinceañara cruises, anniversaries, Bar/Bat Mitzvahs and baby showers. And of course, we are also the perfect wedding and engagement venue. We host weddings large and small. Many are presided over by our friend Captain Arnold and we work with every type of budget. The Skyline Princess is available for a full ship charter for all of our events. It often leaves from our home port at the World’s Fair Marina. We also provide full ship private yacht charters from many ports in NY, NJ, LI, Westchester and Connecticut. But if your engagement party or other event is smaller we can accommodate that as well. You can rent a private deck on one of our public dinner cruises. For even smaller events like a small wedding party, we can reserve a table or two for you. Whatever you have in mind, let us know. Decide who’s hosting. Traditionally, but not always, it’s the bride’s family. Set up a wedding registry, if you choose to do so. Once those details are taken care of, it’s time to choose a venue and the Skyline Princess is the perfect venue for an engagement party. You want to have both families there as well as your closest friends. The Skyline Princess is Coast Guard certified and perfect for any size event. The ship is fully climate controlled and sails all year round. The top deck of the ship can be opened or completely enclosed. It is equipped with a dance floor and a DJ space. You’ll never find a more memorable place to announce your engagement. Skyline Cruises has top notch food. All of it is created by our in-house chef. We can arrange anything from a full sit down banquet to a casual cocktail party. If there’s a need you have for your engagement party, just ask us. We want to make sure that your announcement is unforgettable. 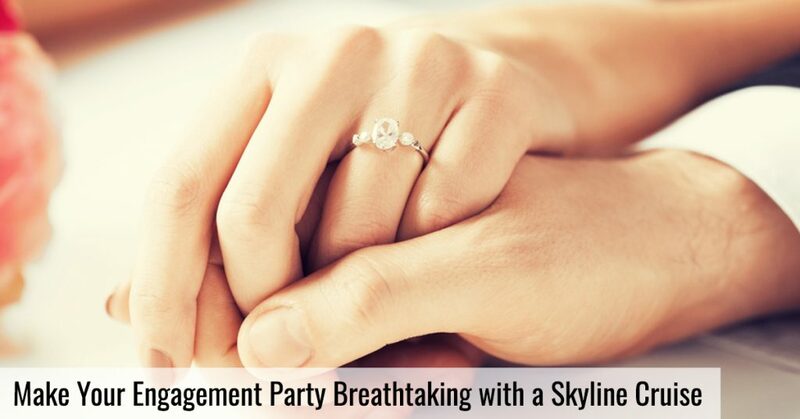 Let everyone know that you’re engaged on a NYC Skyline Engagement Cruise. Contact us today.